NTLab Review 2019: Is NTLab a Good Hosting? 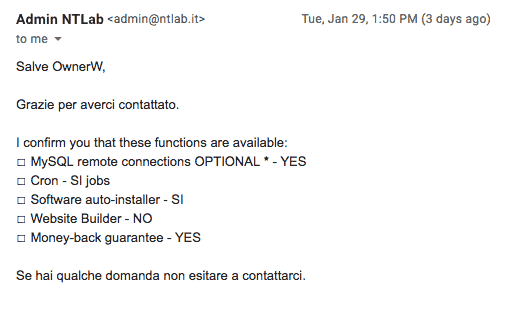 NTLab is a well established Italian hosting provider. The lower-tier plans have a poor uptime guarantee and many added cost features, however, the resource quotas are generous in all plans. NTLab is an Italian company that has been in business since 1999, with more than 4,000 servers located in data centers in Europe and the U.S. The comprehensive website is available in Italian. When you purchase a plan from NTLab, you can choose to have servers located in its own U.S. based data center or servers co-located in a European data center. All of the plans use SSD for faster disk speeds, and while the shared hosting plans run on Linux, if you’re purchasing a dedicated server, you can choose either Windows or Linux operating systems. The uptime guarantees are a little unusual; the Economy plans get a well below par 99.5% uptime guarantee and you need to upgrade to a “Professional” plan to get an industry standard 99.9% uptime guarantee. There are all the usual advanced level features such as PHP versions 5 through 7, CGI, Perl, MySQL databases, and phpMyAdmin tool. Cron jobs are also allowed for scheduling repetitive tasks, along with remote SQL connections. The situation is less clear regarding beginner-friendly tools, and I needed to contact support to get more information. It was confirmed that there is a one-click installer, but no website building tool, if that’s an important feature for you. Unique value add-ons offered include free consultations for (a pretty vague) “every need” and custom hosting configuration, both of which are much more hands on services than usually offered in shared hosting plans. Alongside the shared hosting plans, there’s a huge number of VPS and dedicated server plans, so if you’re likely to need to scale your online presence in the future, this could be a good option for you. There are so many plans and prices, it’s quite hard to get a feel for the prices, and to make a judgement about the value for money. Most plans come with a Free SSL certificate and free domain name, which is excellent. Briefly, there are two tiers of plans “Economy” and “Professional”. The Economy plans, as you’d expect, are cheap, but the caveat is that a lot of the features (e.g., daily backups and Cron jobs) are a paid extra. That said, as long as you read the feature inclusions carefully, the cheaper plans include more than enough resources (including unlimited domains) for most everyday users. Plans can only be bought in one year terms and you need to select either Standard or Full monitoring of the account, which if you choose the latter, comes with an extra cost. To top it off, there’s a set setup fee added. To be honest, I don’t like it when providers nickel and dime customers like this. There’s a good variety of ways you can get support. Logged out users can access a comprehensive FAQ section and existing customers can login to a help desk area. You can email, phone, submit a ticket, or hop on live chat with customer service representatives who are available 24 hours a day. When I visited the website at around 10:00 AM on a weekday, the live chat window was offline. I sent an email and received a response later the same day. The reply was polite and answered all of my questions in full, clarifying some of the beginner friendly features. I can’t back up this statement on the about page: “NTLab is now recognized as one of the worldwide market leaders in the hosting industry”, but I can tell you, although the uptime is disappointing, the plans run on SSD, have 24/7 customer service, and offer some unusual features such as free consultations. Wondering how NTLab stacks up against other Web Hosting companies? Enter any other Web Hosting company and we will give you a side-by-side comparison.